All project pages now have a new “Interact” tab from their edit page. The interact tab is where you’ll find any tools itch.io provides to help you keep in touch with those interacting with your game or project. 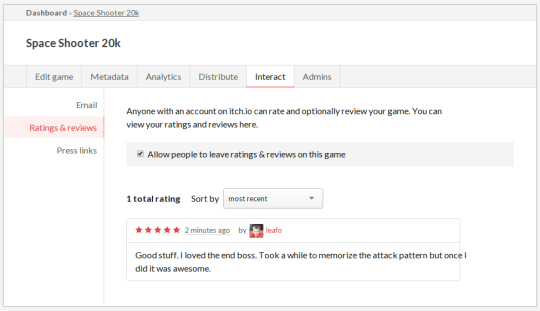 For quite some time itch.io has provided a system for people leave ratings and reviews on game pages. For the most part, the ratings and reviews were inaccessible to anyone except the person who created them. With the release of the new interact tab, project owners can now browse ratings and reviews. Because ratings and reviews don’t make sense for every project, we’re also letting your disable them. From the Ratings & reviews section in the Interact tab you’ll find the switch to disable the feature. itch.io’s press system is an opt-in system that connects game developers to people with “press accounts”: members of the game press who write articles, produce videos, record podcasts, etc. All press account holders are encouraged to participate in the system by uploading links to the content they product. With the new “Interact” tab, if you’ve opted your account into the press system, you can now view any links about your creations added by press account holders. Look forward to more features expanding both press links and reviews & ratings in the near future.